Terms and Conditions - Data Graphics Inc. Terms and Conditions - Data Graphics Inc.
Data Graphics, Inc. morals and values are to provide good value and stand behind their product that it meets the specification you asked for. We like a good hand shake or an email stating the product will be there on the designated date and meet the revision level. However, sometimes attorneys and other details get in the way! Here are some basic terms and conditions on how Data Graphics works, as well as our industry. It is our hope that we will exceed your expectations and the product arrives as you desire. Should you have any questions, please contact your main Sales Engineer to discuss further. Terms are 1% 10 net 30 upon approval, Credit Card or COD, FOB in Mt. Dora, FL; unless negotiated. If paying by credit card, the card will be checked for validity upon order confirmation. The card will then be charged the full invoice amount, including any applicable sales tax and freight, when the product is shipped. Should the card decline, it is our expectation that updated card information is provided the next business day. If credit card information is not provided and charged successfully the next business day, the package will be rerouted back to Data Graphics. Once a valid card is charged successfully, Data Graphics can then ship the product to you, including a reprocessing fee. All Orders are subject to a shipment quantity of +/- 10%. Rejected Materials must be returned to us within 20 days after shipment. All blanket orders must be taken within a 12 month period. All releases per part number must total minimum lot charge. 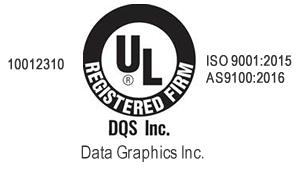 Our industry standard tolerance is +/- .010″. If the shelf life for the product you have purchased is a concern, please contact your sales engineer for a data sheet or request shelf life at the time of the order. All adhesives and some materials we provide do have limited shelf life provided by the manufacturer.